Hi friends! I have a super simple card to share today. So simple, I'm almost embarrased to share it, lol! I recently purchased a 6x6 paper pad of holiday papers, and in it was this gorgeous piece, which I knew had to be a card all by itself. I simply mounted it on a card base and added some glitter paper and sequins for some shine. Done! I usually take waaay too long making my cards so this one was a real treat for me. 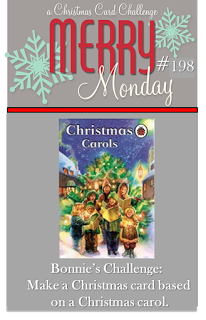 My inspiration came from this week's Merry Monday Challenge, which is to make a Christmas card based on a carol. I have the entire carol on my card! At the Simon Says Stamp Wednesday Challenge, it's anything goes. Thanks for visiting and I'd love it if you left a comment! LOVE this...and I have to laugh, because I made a very similar card today myself!!! I just love that paper....the little scene at the bottom is precious! Love it when the paper does all the work! Oh Yes, very nice. I do love how easy it came together too!!! But . . . now you have that song stuck in my head. Ha. Ha. What wonderful paper, Sandy! A perfect card for this challenge! Thanks for sharing with us at Merry Monday! Very nice! Sometimes you just need to do easy. It has an old school kind of look to me. Great card. Love the ease of this card. And your embellishments to the music are just about perfect. Ha! I am hoarding this one piece of paper - I almost used it last week for the 'church' theme! Needless to say, I love your card! Beautiful depiction of peace and music. Perfect for this weeks Merry Monday. Beautiful card! Such a wonderful design! Very elegant!